On Sunday I spent a very pleasant hour in a local café – inserted into the crypt of a stunning renaissance church, the café offers period ambience, wholesome, tasty food, great coffee, the papers, and fast, friendly service. Every detail has been carefully considered to create a memorable, highly recommendable, venue. 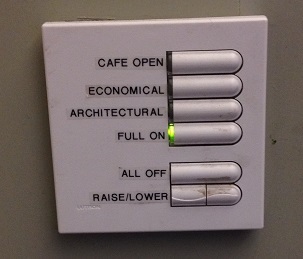 Whilst I was queueing for my lunch, however, I noticed one small detail that wasn’t quite right: the programmable lighting was set to “Full On” rather than “Café Open”. My point? As part of a (no-doubt expensive) sensitive adaptation of a beautiful, architectural space, a (no-doubt expensive) lighting technician had been engaged to create a set of lighting options for every occasion – from out-of-hours cleaning to evening events. And – lighting being one of the most important elements of the Customer Experience – that investment was a good one to make. Except: someone had turned the lights “Full On”, presumably on arrival that morning, and then forgotten to adjust them to “Café Open” mode prior to opening. Does this matter? Well, yes: the lighting design wasn’t being used correctly, meaning that the optimum ambience wasn’t being created (studies have shown that lighting influences our behaviour and perception) – and of course the (no-doubt expensive) investment in lighting design was being wasted. Another detail was that the lighting control panel was situated at eye level, by the café entrance (which is why I noticed it). Logically, it should have been located in a cupboard or other area only visible to the café Team. You may think I’m being picky (I’d also complain if inappropriate music was being played). I’d respond that (a) a simple daily check-list would ensure that the lights were set to the correct level prior to opening and (b) why get 98% of the details right when you could have scored 100%? If you need to be convinced that small details matter, read The Little Big Things by Tom Peters or Why We Buy by Paco Underhill. For support with Customer Experience design and delivery click here.